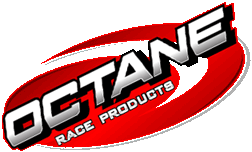 Octane Racing Parts started as a way to bring you Quality Racing Parts. Our pledge to you is that we will do everything possible to sell you the right part at a fair price and get it to you on time. We greatly appreciate each customer and it is our sincere hope that you will give us the opportunity to serve you. We are located just off of I-77 at WV State Rt 47 just 3/8 mi. west of the Interstate exit (exit 174) in Parkersburg, West Virginia. We are very easy to find and look forward to seeing each one of you. Please feel free to browse our web site. If you don't see what you are looking for, you can fill out our on-line Contact form or give us a call at 800 430-7223. You can also come visit us. We are open Monday - Thursday 9:00am to 6:00pm, Friday and Saturday 9:00am to 4:00pm and are closed Sunday.